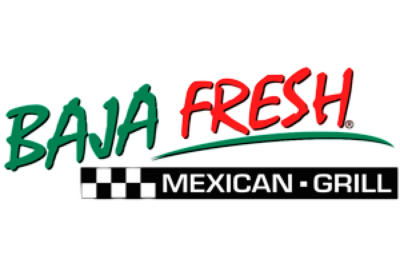 The Baja Fresh menu is filled with fresh Mex and Tex-Mex food, paying homage to traditional Mexican cuisine while also catering for the modern American diet. Learn more about this chain, about their ups and downs, their exciting menu, their hidden secret menu, their nutrition info and everything else you could want to know. Some of the biggest restaurant chains in the world were founded after the owner took a chance, risked money they didn’t really have and then worked hard to make things work. This was true for Papa John’s, it was true for Domino’s and Carl’s Jr., and it was also true for Baja Fresh. In 1990, the two people behind the brand, Jim and Linda Magglos, actually took out a third mortgage on their home in order to pay for the launch. This would prove to be a wise move, because the restaurant took off and they made their money back. What’s more, within 5 years they were franchising, and within a further 3 years they had close to 50 stores across the country. The brand continued to grow in the proceeding years, and in 2002, they sold out to the owners of Wendy’s for $275 million. At the time, Baja Fresh had around 300 locations. But sales were in decline and the brand began to suffer under their ownership. In the years that followed, the brand was sold to BF Acquisition Holdings (who also own Cinnabon and Denny’s) for $31 million, before being sold again to the MTY Food Group for $27 million. Get a taco loaded with a selection of fresh toppings. 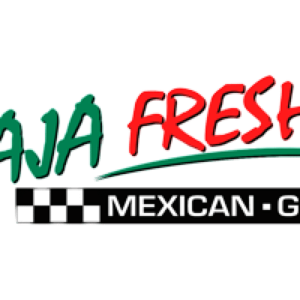 Baja Fresh serves fresh Mexican food, including all of your favorites. There are plates of nachos, taco dishes, burritos, salads and more. You can order all kinds of meat, seafood, vegetable and bean toppings for these and there is also a Kid’s Menu. The kids items are interchangeable with the side dishes, and are merely smaller dishes containing everything from rice and beans, to a plate of meat, salads and soups. All drinks are served from soda fountains (you merely pay for a certain size of cup) and there are Churros available for dessert. This is Mexican and Tex-Mex food that is familiar to the American palate, the sort of food you can also find everywhere from Taco Bell to El Pollo Loco. The difference is in the way it is cooked, the way it is sourced and the variety of options on the menu. If you have eaten at several different Mexican restaurants then you will know that no two brands are the same; it’s just a case of finding your favorite. A simple but fresh guacamole dip, one of the staples of Mexican cuisine and a favorite with Baja fresh customers. 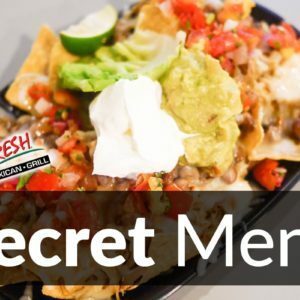 There are plenty of interesting secret menus in Mexican fast food restaurants. But as soon as you venture away from quick-service and into casual dining, they get a little sparser. For instance, the Chipotle secret menuand the Del Taco secret menu are both huge, while the Abuelo’s secret menu is practically nonexistent. Baja Fresh is no exception to that rule, but the Baja Fresh secret menu does exist. It’s just not very big. However, we will fill it as best we can and will also look to add all kinds of menu hacks and secrets to keep it updated. So, drop by the Baja Fresh secret menu page to check on this and see what you can discover. Choose from all kinds of meats and vegetables in your burrito. Baja Fresh menu prices are perfectly acceptable. They are not the cheapest, but they are not particularly expensive even. You will pay a little more here than you would on the Del Taco menu or the Chipotle menu, and across the board they are also fractionally more expensive than Abuelo’s. But for an upscale, casual dining location, they are toward the lower end and Baja Fresh is cheaper than Chili’s Fresh Mex. You can get a taco for less than $3; a Taco Plate (which contains 2 tacos and some sides) for around $8; and a plate of nachos for about the same. There is no Baja Fresh Value Menu or Dollar Menu, but you can pickup a single Churro for about a buck and there are several menu items priced around $3. There are plenty of healthy options at Baja Fresh, but you can also pig out on meaty, cheesy tacos and burritos. Like many modern chains, Baja Fresh are very forthcoming when it comes to nutrition info. They are happy to acknowledge that some of their menu items are loaded with fat and calories, while pointing out that, on the whole, most of their food can be eaten as part of a healthy diet. Their Baja Bowls, which are popular with the health conscious community, are around 500 to 700 calories, depending on the type. These are deceptively calorific, and they also contain an average of 23000mg of sodium. The fat levels are very low, which is good, but everything else is toward the higher end. Instead of one of these dishes, you might want to consider a salad. The salad menu is diverse, including everything from their 1,000 to 1,200 calorie Tostada to their Baja Ensalada, which are just 400 calories on average. These fresh salads are a great source of nutrients, protein and healthy carbs, as well as fiber. What’s more, they don’t have a great deal of sodium and the fat levels are also toward the lower end. To learn more, visit our Baja Fresh Nutrition Info page. This is updated with all calorie, fat and sodium information for all their menu items. A fresh, healthy and basic dish. As mentioned above, this chain has swapped hands a number of times over the years. It seemed to be performing very well and growing at a rapid rate. But that changed when Wendy’s took over and despite a peak of around 300 locations, there are now only around 250. Before MTY Food Group took control in September 2016, Baja Fresh had closed all locations in Ohio and had also dropped many locations in California and Arizona. Baja Fresh store numbers have been in decline for a number of years. But with a parent company that generates over $2 Billion in revenue, it is expected to experience a turnaround following the 2016 sale. There have been several locations in Dubai, but these haven’t always performed very well. There are also locations in Singapore. Baja Fresh is open 7 days a week, from morning until evening. Times differ depending on the location, but in most cases it opens at 11:00am and closes at 9:00pm. These times may be reduced during Sundays and during certain holidays.